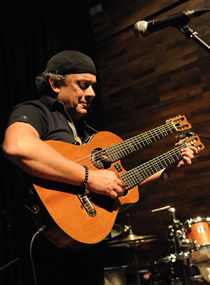 Australia’s Oriental/Indo/Latin Jazz fusion guitar maestro, Peter Dickson’s exciting musical journey started in his teens, honing his skills in the jazz clubs of London, UK. Moving to Australia in 1986, his musical career has vaulted onto the world stage, with an impressive discography bridging multiple musical disciplines and genres in his eleven recorded works. Peter’s live concert touring agenda has involved world travel and playing in concert halls in Europe, North America, Japan, Asia, and Australasia. As well as being a true guitar innovator, he is also a master concert performer, dazzling audiences with his solo shows, which combine virtuosity, emotion and humour, with a strong stage presence. Original in his approach to his music, he designs and handcrafts his own twin neck guitars to achieve his unique musical voice. Music Trader – “Executed with artistic integrity and instrumental precision that is severely impressive”! Mercury – “Flavouring of OZ in fiery Flamenco”! Sunday Herald Sun – “Gipsy music with an Edge”! The Australian – “A frenetic blend of Flamenco, Indian music, POP and Jazz”! Mixed Down World Sounds – “His music is a living breathing entity, always searching for new inspiration and sounds”! The New Post – “A unique style of Gipsy Flamenco guitar”! TV Week – “Guitar lovers will relish his expressive playing”! Peter’s accomplishments and career highlights are too many to include in this executive summary. He has toured , recorded and performed with maestro Tommy Emmanuel; toured and performed with the legendary Dr. Martin Taylor, MBE, arguably the greatest solo jazz guitarist of our times at the Hobart Concert Hall in Tasmania playing material of the great Django Reinhart; performed with Malaysia’s internationally acclaimed jazz guitarist Farid Ali and recorded and performed with respected South Indian Carnatic Indian Musicians, in his constant search to fuse east and west in his recordings. Apart from performing with renowned musicians, Peter Dickson has also recorded the theme for the Barcelona Olympics coverage for the Seven Television Network Australia and the theme to a Hollywood Film, 'Flair' starring Joan Collins, working with film music maestro Tony Montana. 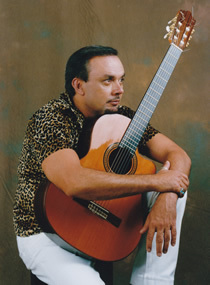 His album ‘Flamenco Falsetas’ enjoyed much success, becoming the tenth most quick-selling album in Australia , reaching the top of the Australian Aria chart that led to a major signing to MRA Music Group, Australia’s premier world music label. Peter has toured with Louis Banks India’s premier jazz pianist who also performs with John McLaughlin, to perform at the Shillong Jazz Festival in India. Peter’s guests on his tours have included Geoffrey Daniel from Shalamar and the Michael Jackson Band, Rie Tsuji, musical director for Beyonce Knowles and Steve Hunter from the Chick Corea Band to mention a few . He was a special guest of Boys 2 Men at the State Theatre in Sydney on their world tour in late 2012. This gifted multi-instrumentalist has an unusual and highly individualistic style of composition and performance that may rightly be called “the essence of Peter Dickson”.